This sounded amazing and it was before the car accident my youngest was in, as well as a few other things to recently hit our family. When the accident happened she asked me if we should cancel. I asked her please not to, I knew by the time it came around I was really going to need a few days away. 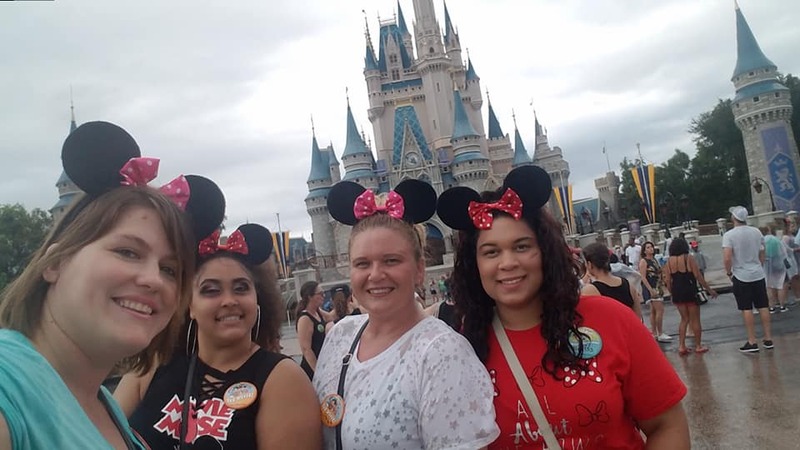 So last Thursday my oldest daughter and I set off to Orlando to pick up my bestie and her daughter from the airport and head to the resort. 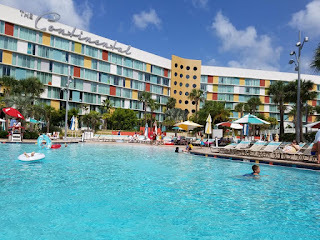 We stayed in the BEAUTIFUL Universal Studios Cabana Bay Resort. 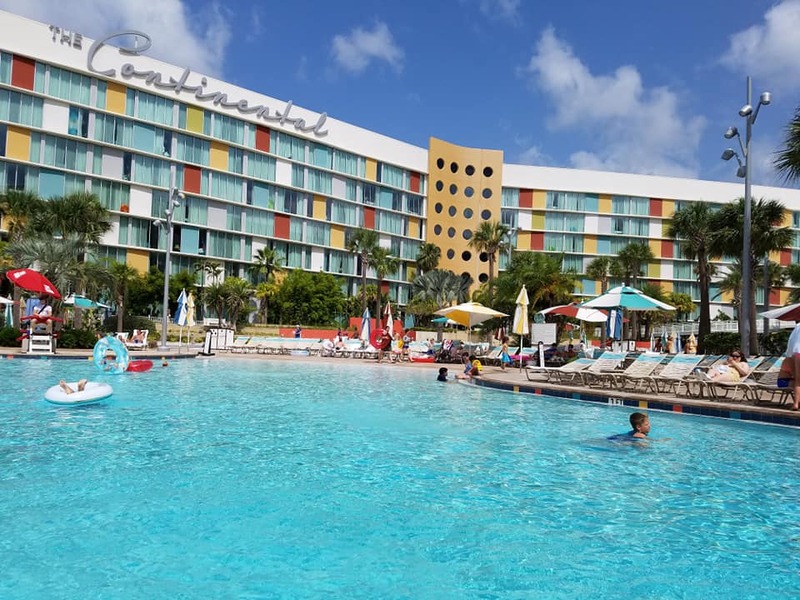 It is 50's & 60's inspired with over 2,000 rooms, 2 pools, water slide, lazy river, hot tub, diner, bowling alley, gym, game room and more... THIS place was everything we all needed for a few days away from everyday life. This was surely something I could not afford at this time but my girl would not let me stress it and made sure everything was taken care of. I cannot express how much I appreciate this. When I make my first million in life I swear I am making sure she gets THE best vacation along with a few others that I love who so deserve it! Over the next five days we spent a whole lot of our time in the lazy river... it was really the absolute best. There are a few waterfalls and it stayed a little warmer than the pool so it was the perfect place to relax. 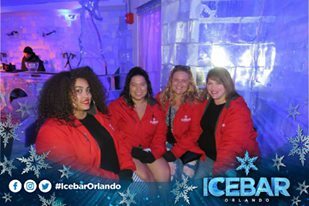 One night we hit up the Icebar which was COLD at only 18 degrees but really neat to be in, along with the Fire Lounge next door. 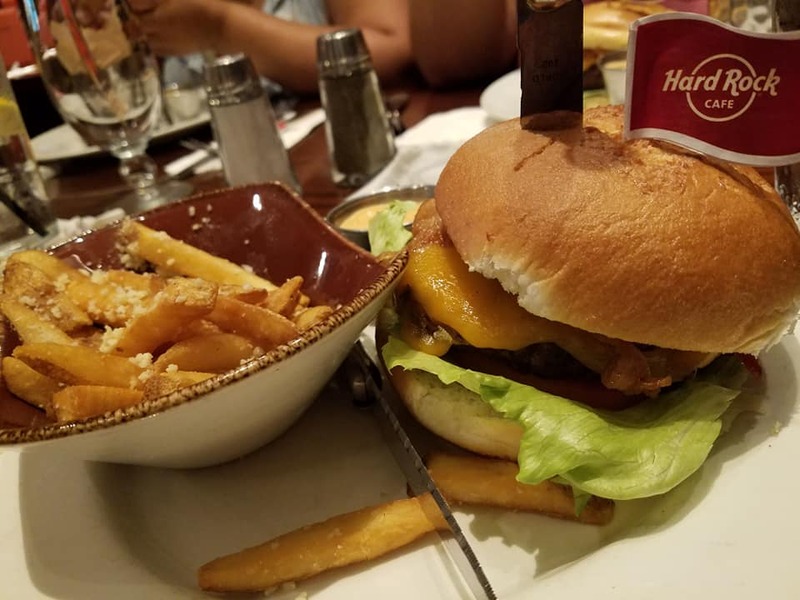 We took the ferry to Universal's Citywalk another night having dinner at Hard Rock Cafe (They had the BEST gluten-free burgers!!!) and dancing the night away to DJ Chino inside The Groove. 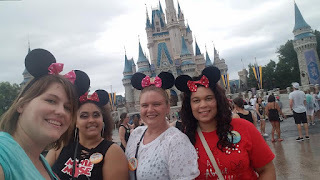 We wrapped everything up with a VERY interesting day at Disney and then dropped them back off to the airport Monday morning which was so hard to do! I have to say the best thing though was seeing the girls together.. they were super close as babies and small children but I moved us away from Virginia when they were 9 years old and their time together has been limited since then. I had my oldest at 16, my best friend had hers at 17 and they were born just eight months apart. They call each of us Aunt, we have been family. Now they are both funny, opinionated and leaders in life. Watching them conspire together, argue, laugh, dance and more was so fulfilling. I also just appreciated time with my girl. We've been friends for 27 years after meeting at a rec center sleepover for fifth graders going into sixth grade. We have literally been there for each other through some amazing highs and horrific lows. Over these few days we just got to hang with our girls, each other and totally unwind. I am so very grateful. This week it's back to reality for all of us.. I shot hundreds of photos.. a few made it online, even more made it to my storage. There were convos, laughs, arguments, fun times and lots of memories made. Those special memories made that will stay with us. So the next time I am driving to Orlando, or when I think of Universal I'll have those memories and when all is said and done those memories are what matter most. Her daughter, my niece, had an amazing 21st birthday that she will surely never forget and I am so glad we got to be a part of it!!! Tell everyone who means anything to you that you love them today and make sure you save a little time to make some memories with each other.